The teenager from Spain will play Yshai Oliel for a spot in the main draw of the €43,000 ATP Challenger clay-court event. 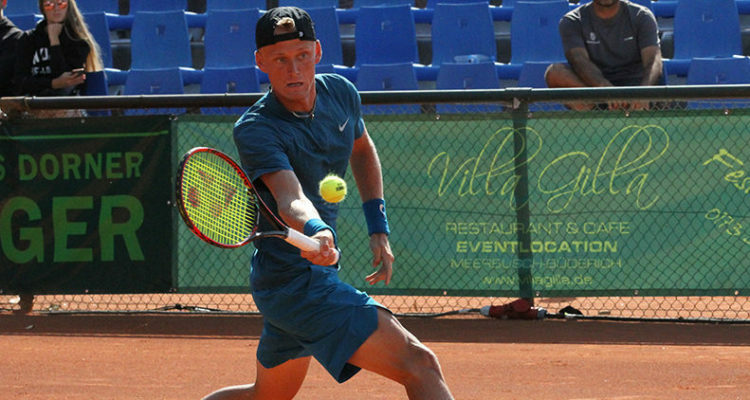 Nicola Kuhn continues his quest for a spot in the main draw of the Tennis Open Stadtwerke Meerbusch. The 18-year-old Spaniard, who made a successful debut at ATP Challenger level here two years ago, fought past Raul Brancaccio of Italy 6-4, 3-6, 7-6(5) in Sunday’s second round of the qualifying. Kuhn will play against fellow teenager Yshai Oliel in the final round. The left-hander from Israel beat Sebastian Fanselow of Germany 6-4, 6-2. Main draw action will also kick off on Monday, headlined by No. 7 seed Arthur de Greef of Belgium taking on Bernabé Zapata Miralles and sixth favourite Filip Horansky of Slovakia facing Austrian young gun Jurij Rodionov. This entry was posted in ATP Challenger Meerbusch, ATP Challenger Tour and tagged ATP Challenger Tour, Meerbusch, Nicola Kuhn.